It was so simple to join Shubizz Holiday Giveaway. 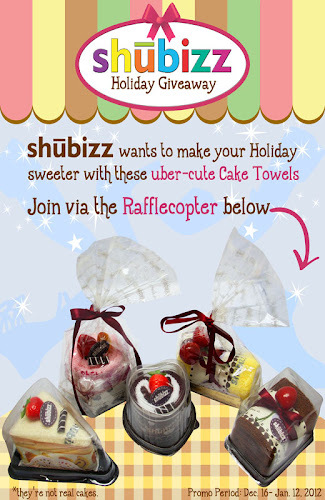 You may win uber-cute cake towels by simply joining and following the mechanics through rafflecopter posted on their fb page. Kindly click the photo below to enter the Shubizz Holiday Giveaway. This entry was posted in Giveaway and tagged proof of prizes in giveaways, Win a Shubizz Holiday Giveaway. Bookmark the permalink.